xmp-cd is the native Audio CD plugin for XMPlay. It's included in the main XMPlay download, get it from the XMPlay page at Un4seen Developments. Put xmp-cd.dll in the plugins folder (see Installing XMPlay). You can open the configuration window from the Plugins: Input page of Options and stuff. The listbox will show which drives are available on you system. When you tick Lock door while playing, Windows will not allow the CD tray to open when XMPlay is used the disc, so your music will keep going. Limit read speed will have the drive spin slowly, instead of rattling at full speed. XMPlay can lookup the disc you're playing in the Compact Disc Database to fetch tags like artist, album and track titles. The Server field should contain the address of the CDDB server. By default you can choose from the FreeDB server at freedb.freedb.org and the MusicBrainz-through-FreeDB server at freedb.musicbrainz.org. You can use a different server, or leave the field blank to disable CDDB lookups. If XMPlay finds multiple matches for your CD in the database, it'll pop up a window for you to select the right one. To avoid requesting information on the same disc every time, XMPlay can Cache results of the lookups. Newer Audio CDs often use CD-Text, and you can tell XMPlay to Use CDTEXT over CDDB for tags, as the tags on the disc have only a slim chance of being wrong. 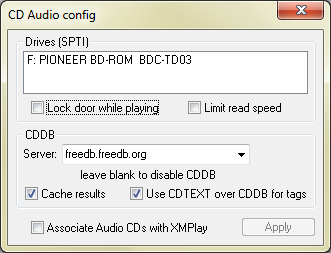 Associate Audio CDs with XMPlay will make XMPlay the default program to play Audio CDs with. Hit Apply to apply this change to your registry. If you're trying to open a mixed-mode CD (with data and audio tracks), you won't be able to find the .cda track indicators via the Open file(s) dialog. Instead, you have to open the Open folder dialog and load the whole disc. You can play a DTS Music Disc (also known as DTS Audio CD) through XMPlay. Using the bit-perfect output of ASIO or WASAPI exclusive, you can feed the stream into your external hardware DTS decoder.